geen geknutsel op de autosnelwegen in ons land meer. Pinkie Bowtie was in Hamburg for a whole week (and in Milan for one night) for Papiripar Festival, a festival Felix Kubin put together. Felix had invited us for the "visual part" of the exhibition, in a sort of big garage in from of the main concert hall and bar of Westwerk, a old school German venue a rich man bought for artists and musicians to have fun with. Pinkie Bowtie "made" 400 cardboard boxes, and with those boxes we changed the space daily. 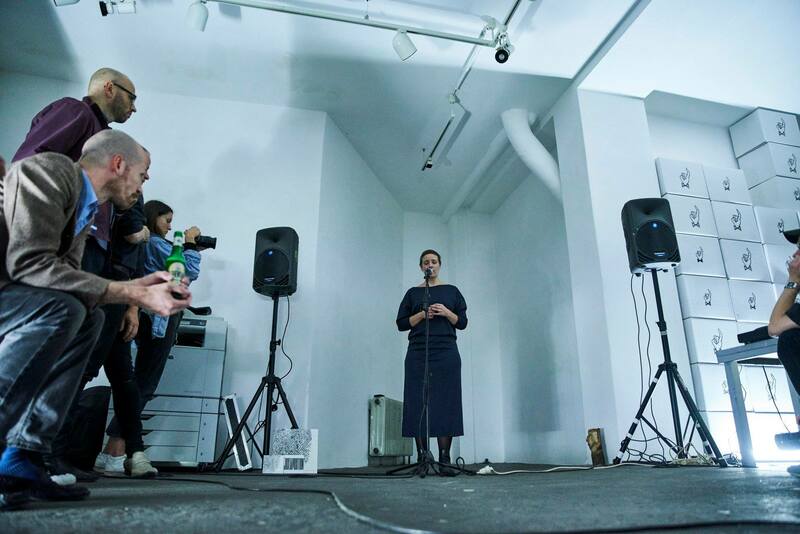 Instead of showing artworks, we decided to put together a program of our own, inviting people we wanted to see perform, and ourselfs of course, as we are proud nor arrogant, baroc, non baroc, Laurel & Hardon, Deutch und Verschwunden. On the first night we opened the front doors dramatically, this way the audience was confronted with MR Marcaille, a French one man band, playing drums, cello and vocals simultaniously. Quite the man of the hour he was, spilling a huge pile of snot on his bare chest, and trying to sell it as merch after. Macaille's sound could be compared to Motorhead meets Lightning Bolt meets Charlemagne Palestine through a distortion pedal etc.. Right after, Vom Grill played a "pathos for piano, tape player and new lost friend", which resulted in a tomato head the size of a 55 year old pumpkin. Luckily this happened before, and not after the incredible vocal performance of Agnes Hvizdalek. Much like her Norweigian collegue Stine Janvin (who just published a incredible record of kinetic music on PAN Records!) her sound poetry is less spritzi spritzi and more pure alien sound, almost industrial at times, simply using her own voice, no effects. Vaast Claxon followed with reading/playing one of his Principium books on the instrument Kris Remörk Delacourt made for him. Things get blurry from then on, as in, i can not really remember who was first, last and always. I think Hank Scmid In Der Beeck followed with a reading of his poetry, followed by Peter Fengler performing a piece by Stephane Bloth. 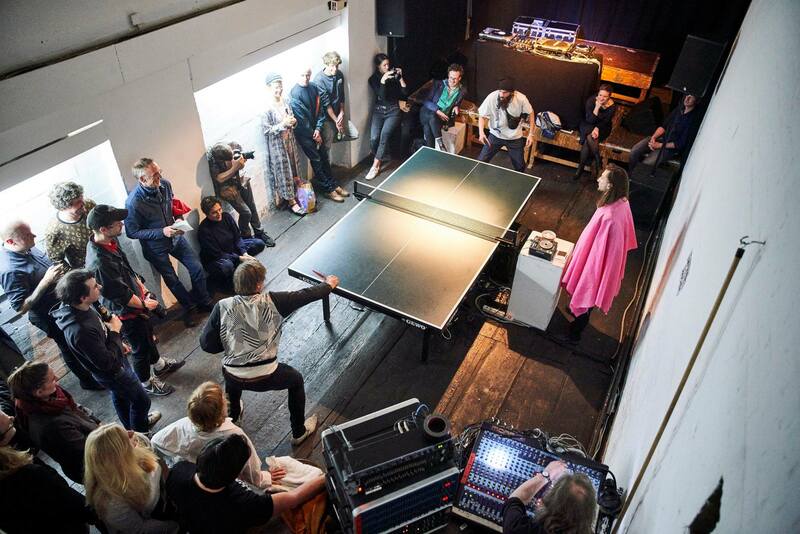 In this Piece a ping pong player yells SCHEISS whenever he misses the ball, this game is played continiously while in the background one can here a list of people that are also possible SCHEISS. in between these concerts we played publications by De Player and Ultra Eczema shortly. The evening ended with a form of dance wash performance by Rebecca Erin Moran and Dagrun Adalsteindottir in double shoes and wiped bra's. On Thursday the Pinkie Bowtie team went to see the Sanguine exhibition Luc Tuymans currated at Prada Foundation in Milano. Vaast Colson and myself bot have older works in this exhibition, Peter Fengler did a skype lecture which was broadcasted over skype straight into the Papiripar festival. In the evening Peter Fengler performed a few vocal pieces at Legno in Milan as well. On Friday we re-arranged the cardboard scene at Papiripar into a soundpiece, and on Saturday the fantastic Sven-Ake Johansson performed in it and a 1 hour long exhibition was shined through a projector, 60 people showed a work for one minute each. This kind of got lost because in the room next door loud music was going on.